GENT, Belgium (VN) — How grueling was Sunday’s rumble over Flanders fields? Just ask Gent-Wevelgem runner-up John Degenkolb (Trek-Segafredo). Howling winds and a biting pace made it one of the most physically challenging and thrilling editions in recent memory. The race exploded in the first hour under the pressure of early attacks and whipping crosswinds. The fact that pre-race favorites Deceuninck-Quick-Step missed an early move meant everyone up the road piled it on even more. The average speed in the first two hours of racing was north of 50kph. Add two passages over the Kemmelberg, and even steadier cross-headwinds on the road back to Wevelgem, and Sunday’s race put the peloton under maximum pressure. Gent-Wevelgem delivered another thrilling edition on roads which taken on their own, might not suggest such a wild ride. Despite the double-assault of the Kemmelberg and the recent addition of gravel roads on a few sectors of “plugstreets,” the wide-open terrain in western Flanders means wind is typically the main protagonist of the race. And the wind did not fail to deliver. The peloton woke up Sunday to see the flags whipping horizontally on their poles. Everyone’s radar was on high alert right from the rollout. The attacks came fast and hard, pushing the average speed above 53kph in the first hour. And to make matters even more interesting, a front group of about 20 riders eventually formed. There were a lot of jerseys from Trek-Segafredo, Jumbo-Visma, and Bora-Hansgrohe — including Wout van Aert and Peter Sagan, respectively — but none of the big favorites from Deceuninck-Quick-Step. That set the stage for a six-hour, knock-down, drag-out fight that left riders collapsing at the finish line in exhaustion. Some of the post-race power numbers revealed the veracity of the effort. The Velon website later posted some of the key indicators from the power meter of winner Alexander Kristoff: 7,350k/cal, 45.2km/h, and a whopping average power of 345W. It takes that level of effort to win a monument race like the Tour of Flanders or Paris-Roubaix. 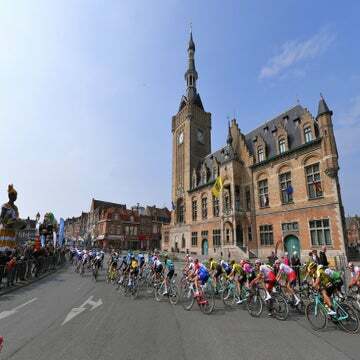 Gent-Wevelgem does not quite have monument billing, but Sunday’s edition was as hard and physically demanding as anything the peloton will face this spring.